navarro was first acquired by the dodgers in january of 2005 in what was essentially a three-team trade with the yankees and diamondbacks. he was part of the package that the yankees sent to the d-backs for randy johnson, and was then bundled with a few minor leaguers and sent to the dodgers for shawn green. 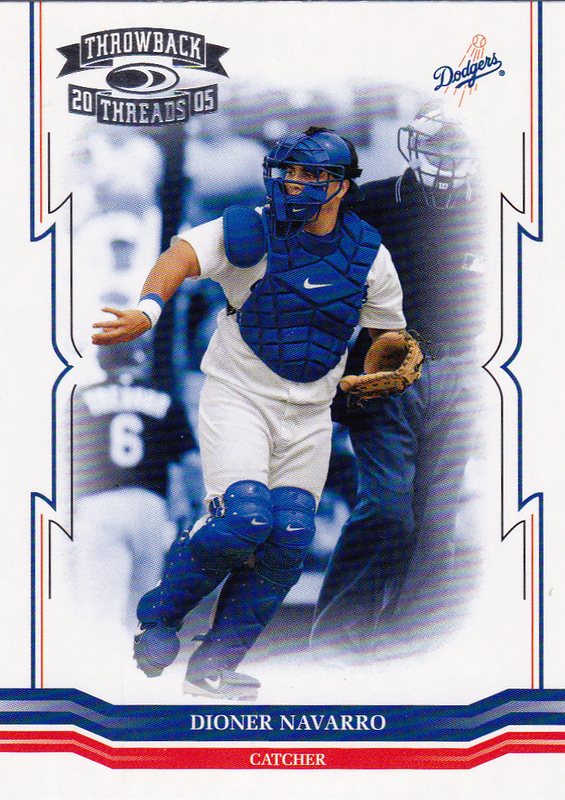 since depo had forgotten to get a catcher when he traded away paul loduca during the 2004 season (a deal that was supposedly in place at the time to bring back charles johnson fell apart), jim tracy wound up using jason phillips behind the plate for much of the 2005 season, but once navarro was called up in july, he wound up with the bulk of the playing time. 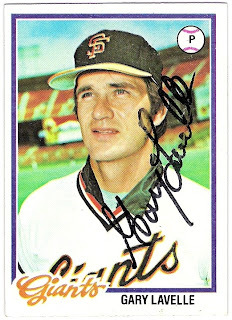 he hit .273 in 50 games with 3 homers (his first career dinger was a walk-off against the mets) and was pretty good on defense although he threw out only 21% of those who attempted to steal against him. still, he was only 21 and it looked like maybe the dodgers had a decent catching prospect. 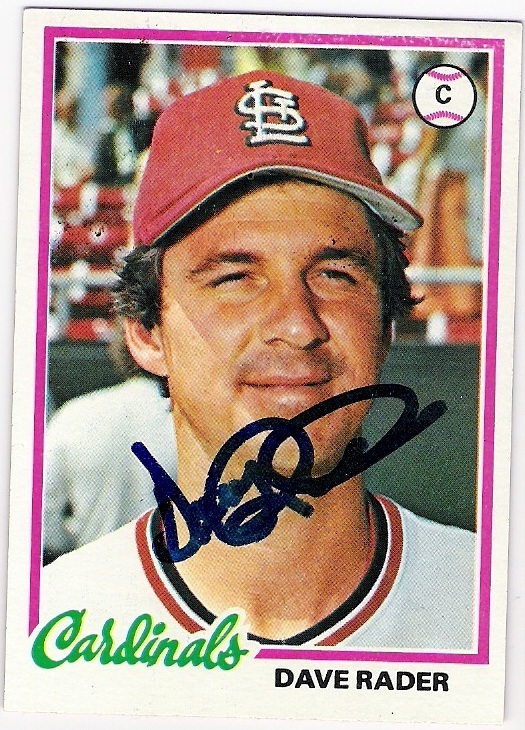 after the 2005 season, paul depodesta was fired and ned colletti took over. ned signed sandy alomar to help with the catching duties for the 2006 season, and he also called up russell martin in may of that year. martin played well, and so in june of 2006, ned traded navarro, along with jae seo and another guy to the devil rays for toby hall and mark hendrickson. and cash. sweet mccourt lovin' cash. 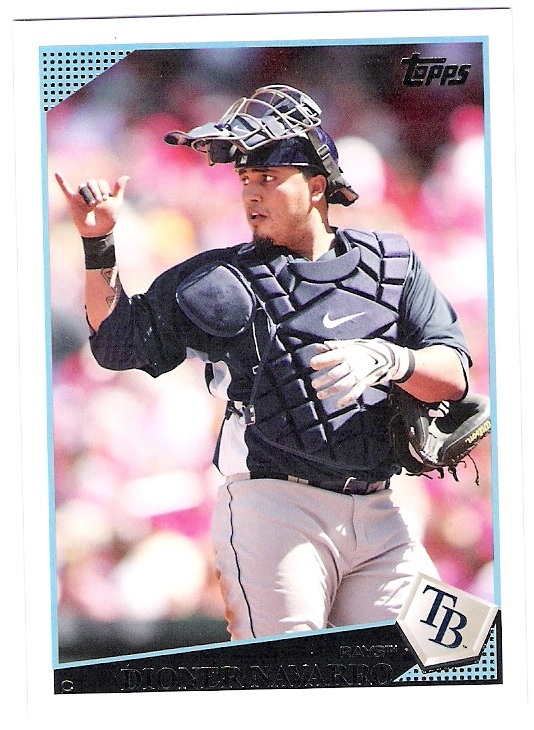 with the devil rays/rays, navarro hit the peak of his bell curve. in 2008, he played in 120 games, hit .295, made the all-star team and helped tampa bay get to the world series. 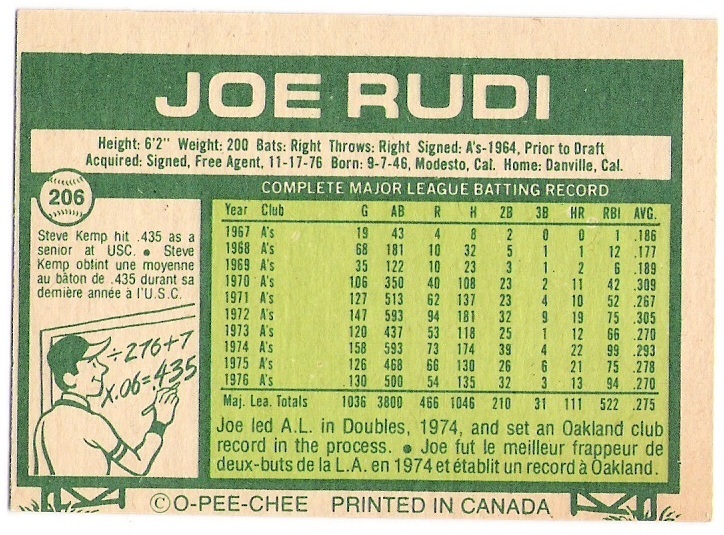 in the alds he hit .400, and after a .192 performance in the alcs against boston, he hit .353 against philadelphia in the fall classic. 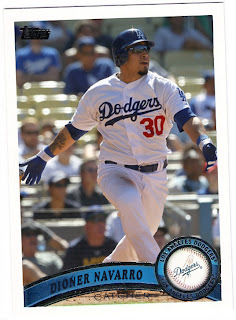 however, after a poor 2010 season in which he played in just 48 games and hit .194, navarro hit the free agent market. luckily for him, ned was there to pick him up. this card won't be, however, as i didn't see navarro's name on the draft checklist for the 2011 topps update set, and then there's that other thing - navarro was dfa'd by the dodgers last week. 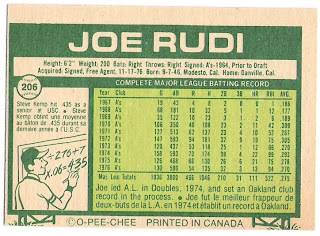 he was hitting .193 in 64 games although he did have a couple of big walk-off hits this year, including one in that game last month against the padres in which the dodgers were no-hit for 8.2 innings. there is some harmonic convergence going on in the next few weeks between this site and my other one, oh my o-pee-chee! of course, it's because i am making it be that way. 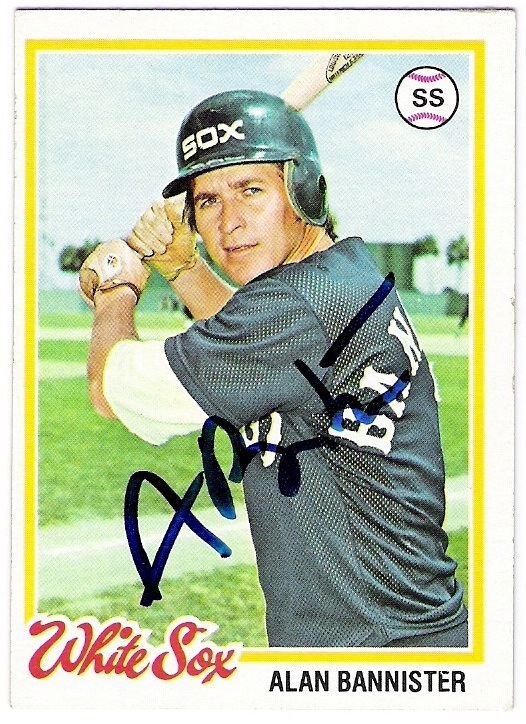 yesterday i featured steve garvey on both sites, and today, it's mike easler's turn. 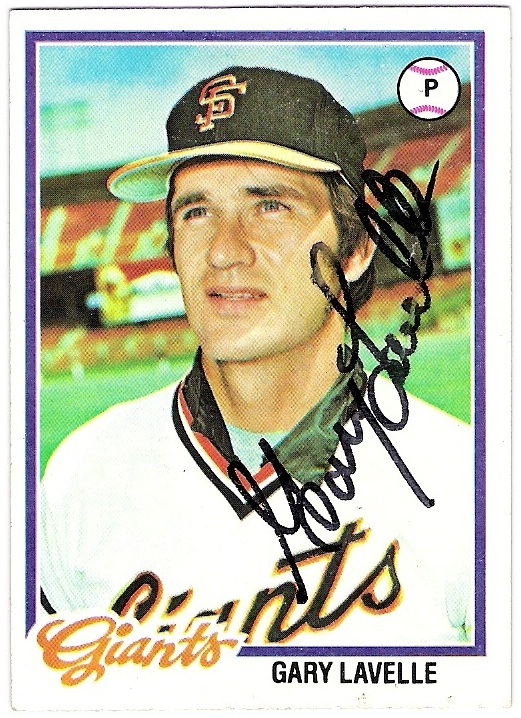 you may know him by his nickname 'hit man'. a few years ago, when joe torre took over as the dodgers' skipper, he wanted to bring don mattingly with him to be the hitting coach. 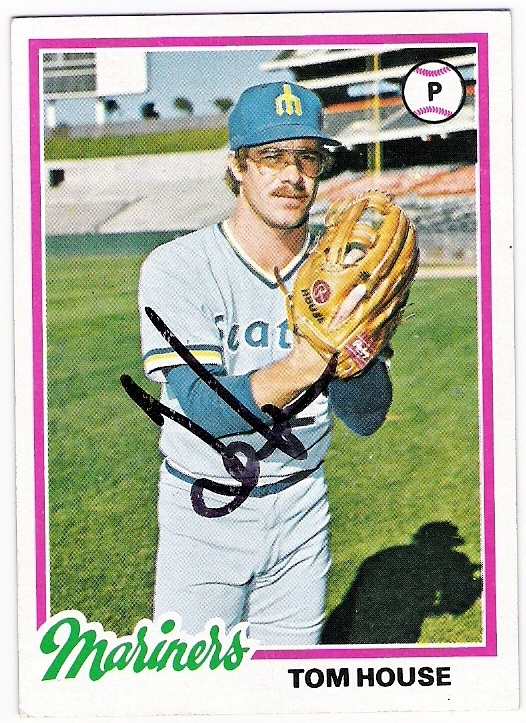 mattingly accepted the job, but had some personal issues to tend to in indiana or wherever. so, mike easler was tapped to fill in. 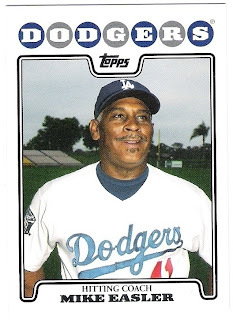 in doing so, he got to be included in the 2008 topps dodgers premium team set, that 55 card extravaganza from which i may someday showcase each card. 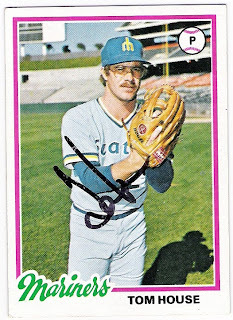 by the time that card was issued, easler had played in parts of 5 seasons for the astros, angels and pirates. to further confuse things, he didn't make it out of the minors at all during the 1978 campaign. he did get to the big club in 1979 and was a member of the pirates' 'family' that won the 1979 world series. he stayed with pittsburgh until they traded him to the red sox for john tudor in december of 1983, creating the need for the variation card which is celebrated today at oh my o-pee-chee! 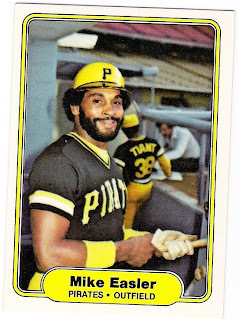 it features the hit man in the visitor's dugout at dodger stadium with a lurking luis tiant (and a dude in streetclothes) in the background. 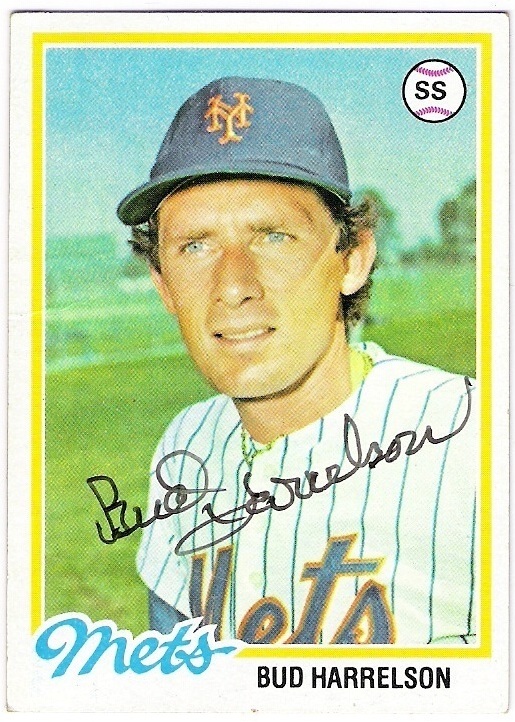 26 years later, easler was sitting in the other dugout. voici a vous, hit man! 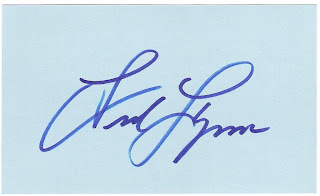 thanks for signing my card! in honor of the last 1983 o-pee-chee variation to be featured over at oh my o-pee-chee! 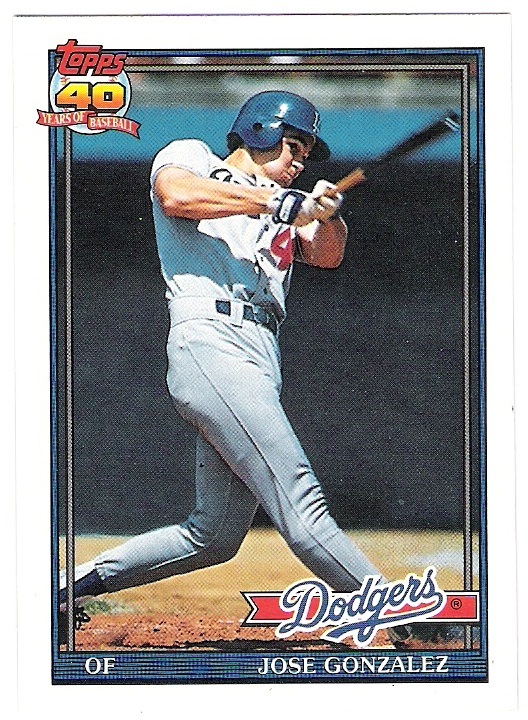 today (which just happens to be steve garvey's team and text variation), i am posting a non-dodger garvey card here on garveyceyrusselllopes. almost completely devoid of blue. ok, here's something to cleanse the palette. 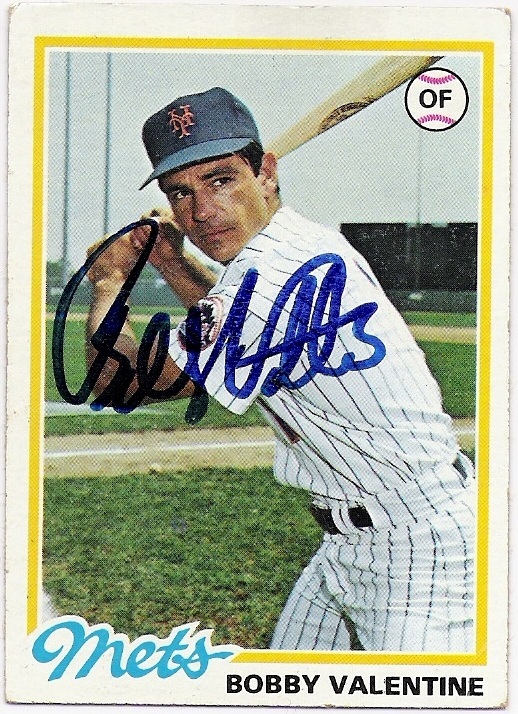 voici a vous, steve garvey! even when you are shown as a padre. sweet, sweet upgrade. i will post another time about the other diamond giveaway goodies i redeemed. 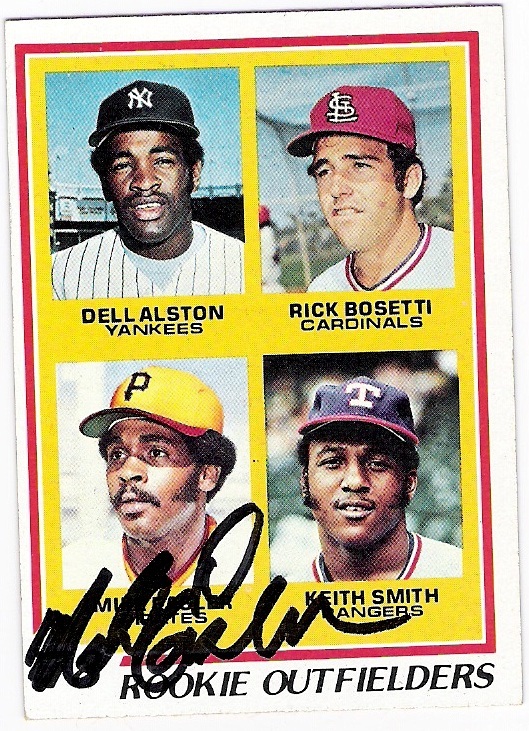 which is really bill bean, and a couple others courtesy of some recent trades (which i will post later as well). so, the list is re-populated over on the right. 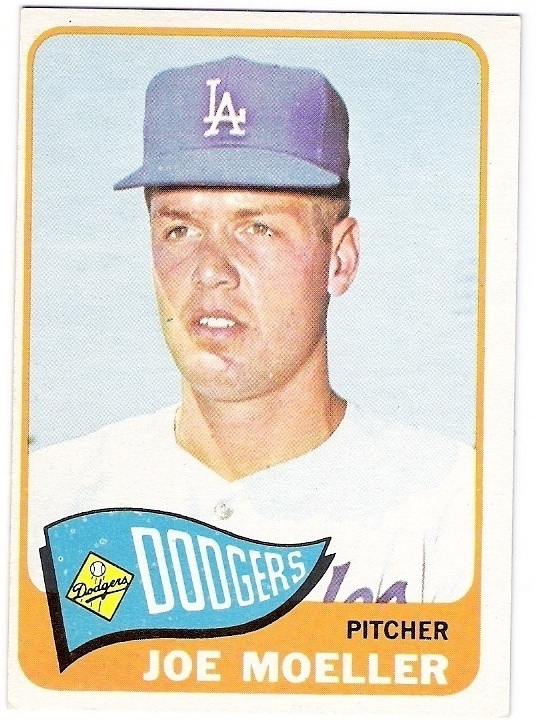 it's getting heavy with oddballs as i have decided to complete the dodgers' 1970 decade. let me know if you can help! you will be rewarded! a couple of weeks ago, i was informed by my page-a-day calendar that there have been 9 major league players whose last names begin with the letter 'c' that have also hit 300 home runs. three of them played for the dodgers during their careers. 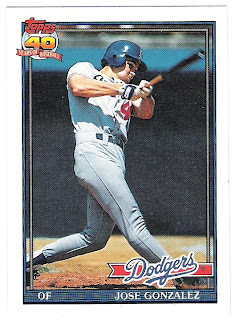 a fourth, jose canseco, made a stop at dodger spring training one year during what turned out to be a glorified book tour. of course. 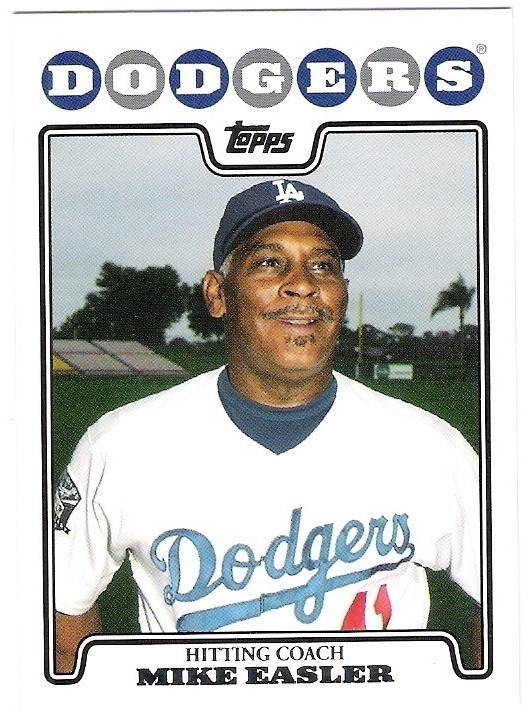 the penguin hit 316 home runs during his career, 228 of which came with the dodgers. 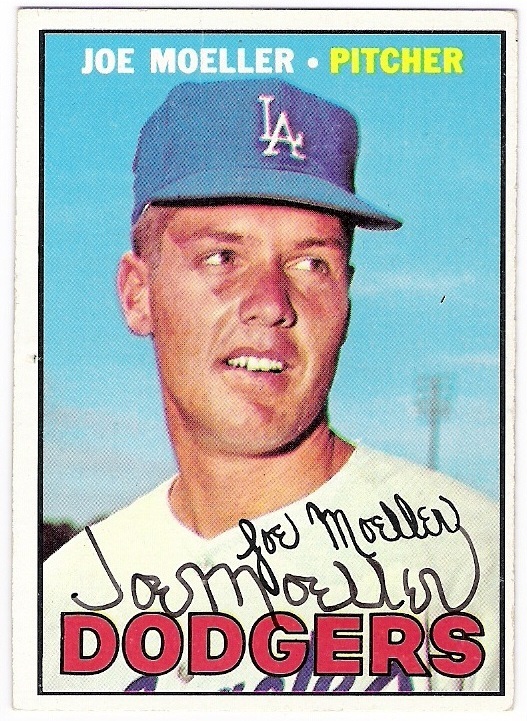 he is currently second on the la dodger all-time home run list behind eric karros. 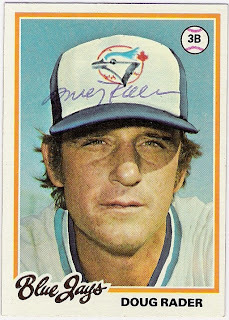 gary carter hit 324 homers in his career, 6 of which came with the dodgers in 1991. his 324 total is the same as lance parrish's career tally. parrish hit one more as a catcher (299 to carter's 298) according to my quick googling. 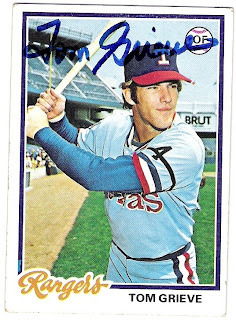 should lance parrish (whose 'most similar' player on his baseball reference page happens to be hall-of-famer gary carter) have received more hof consideration? 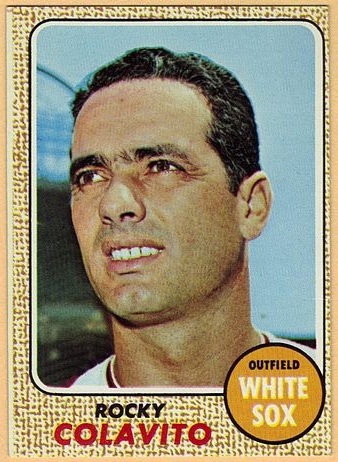 colavito had finished the 1967 season with the white sox and was then purchased by the dodgers towards the end of spring training in 1968. during his time in la, he hit 3 of his 374 career home runs before being released by the blue in july. all three were hit in chicago, and came over a two day span in may. 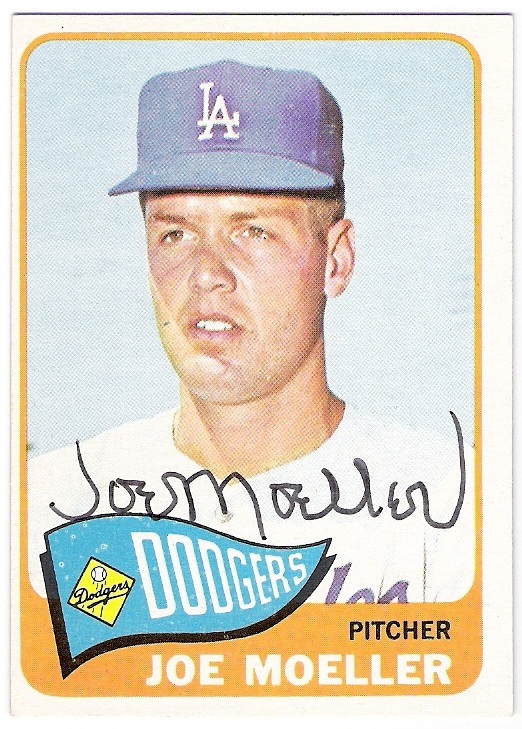 he hit two home runs on may 7th off of joe niekro and then former dodger phil regan. 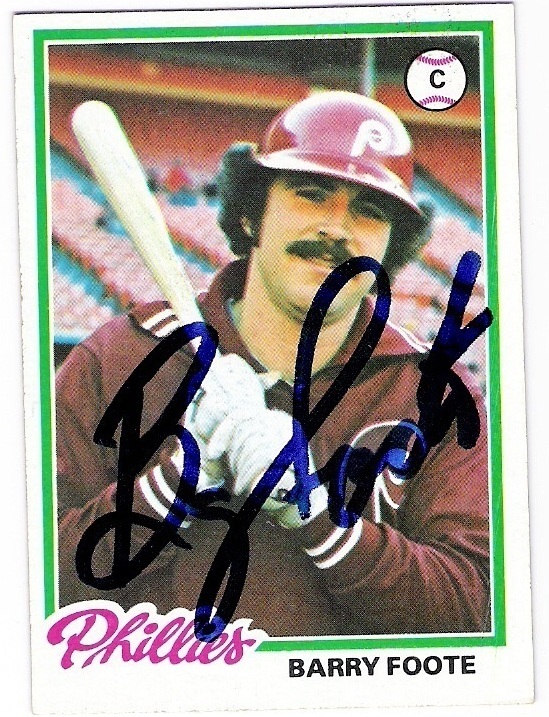 the next day, he hit a bomb off of jack lamabe. and that was the extent of his national league home run hitting. those weren't the last home runs he would hit, however as the yankees got five long balls after they signed colavito for the remainder of the season, his last in the big leagues. 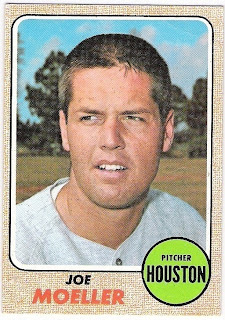 mike cameron needs another 25 so the next guy to join the list is likely miguel cabrera who needs 30.
here's the nolan ryan record breaker. 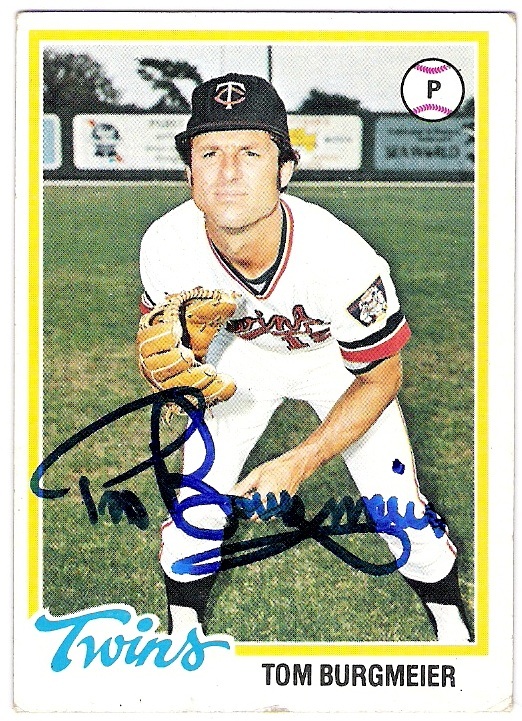 i thought about sending a brooks robinson rb card to a signing, but decided instead to pick up this ryan in an auction. 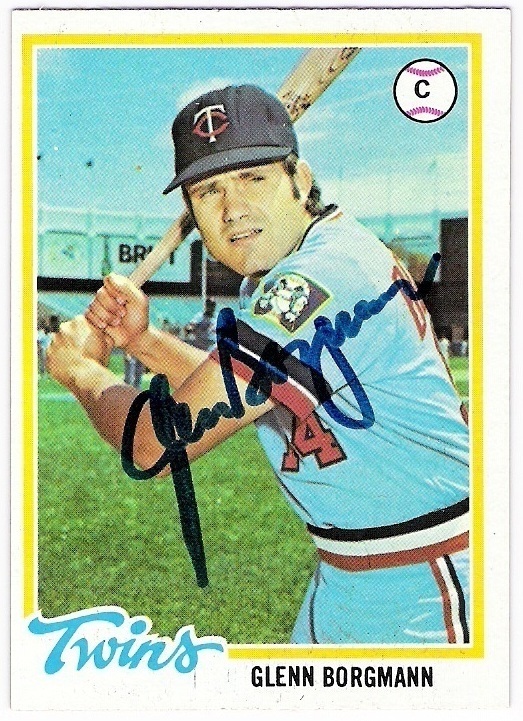 while it would be nice to have more than one of the record breakers signed, i doubt i will get there. 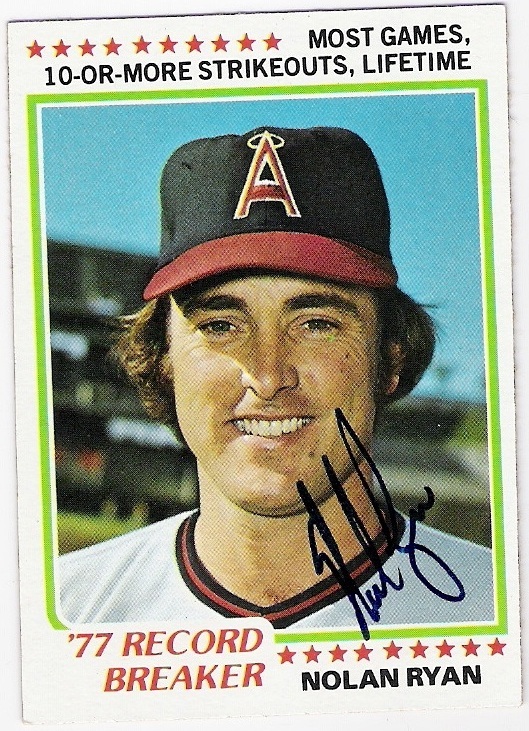 i think the angels have the most number of players in this set with dugout shots. 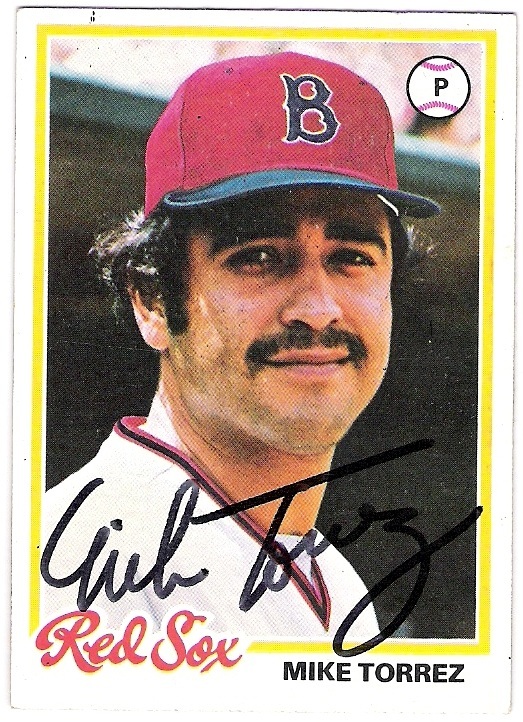 jerry remy and gil flores are two others i can think of off the top of my head. 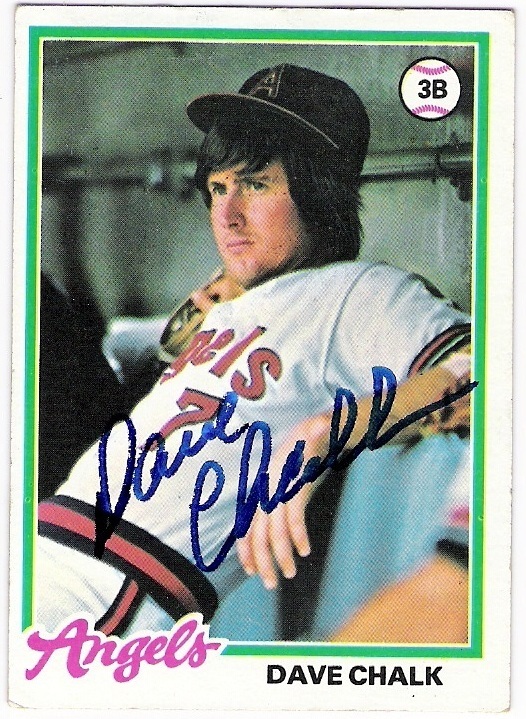 while teammate gary lavelle settles for the dreamer pose. spring training (or is it town ball?) awesomeness. 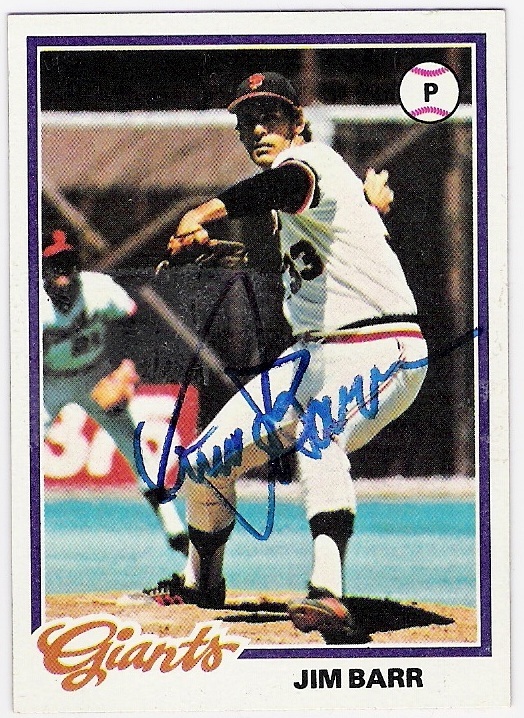 capra's career was cut short by arm trouble, and he had pitched in his last big league game by the time the 1978 cards came out. but he would be on his way to cleveland shortly thereafter. 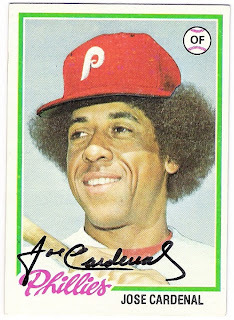 one has to truly appreciate the airbrushing of the phillies hat (cardenal spent the 1977 season with the cubs) around his afro. 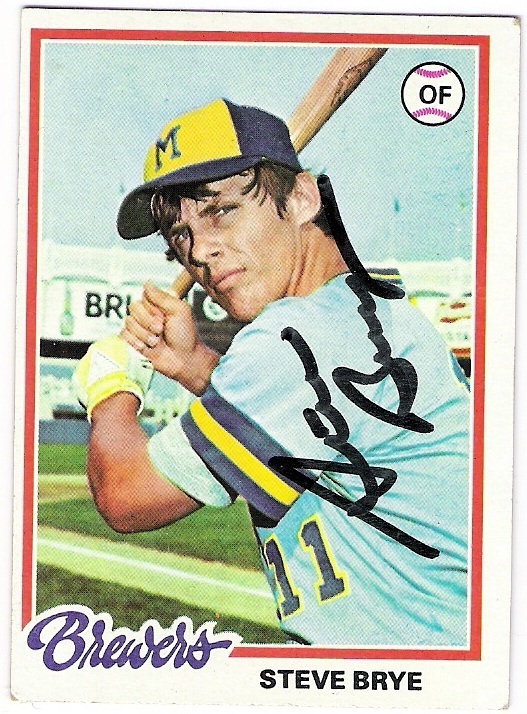 and the autograph isn't bad either. from a jose with an airbrushed cap to a jose with a trucker's cap, here's jose cruz sr.
even though he wasn't a giant, cruz was one of my least favorite players back in my youth. 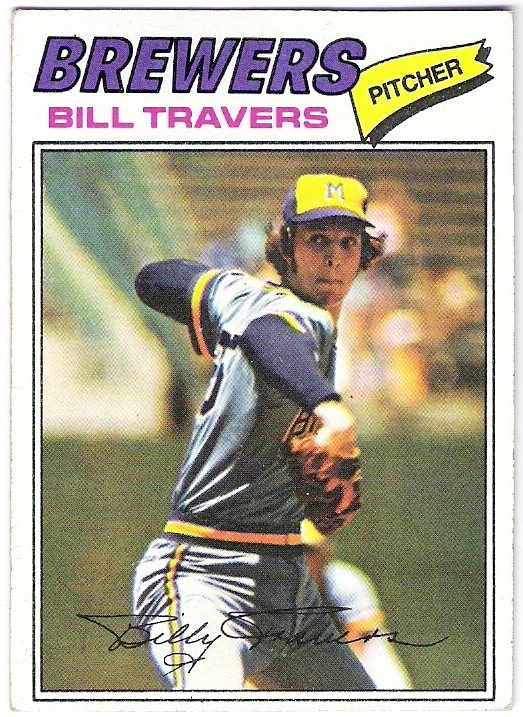 i have bad memories of him against the dodgers' pitchers - hooton, sutton, rau, etc. not good times. 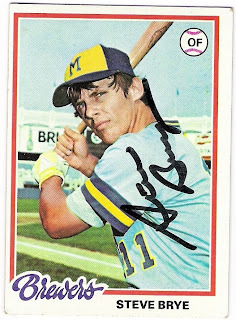 these days i can appreciate his talent and his autograph and not base my fandom on what he did against my favorite team. at least i think i can. the lee walls of his day. 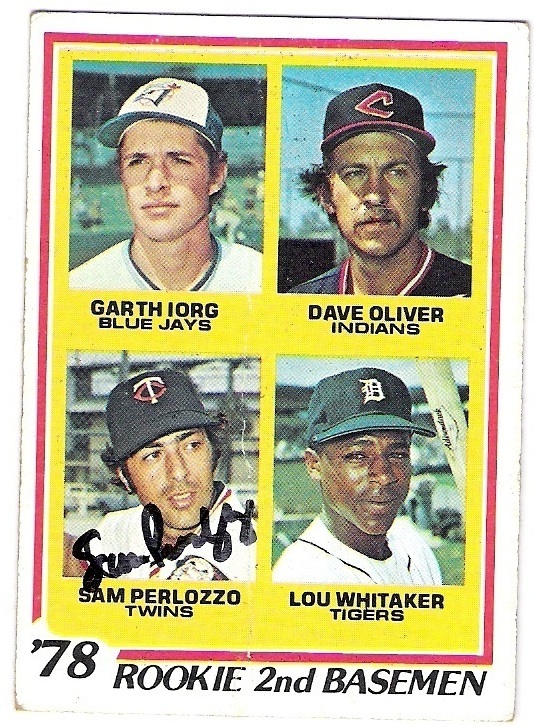 i really wish topps would get back to giving backup catchers their due. i need a dioner navarro card, dammit! 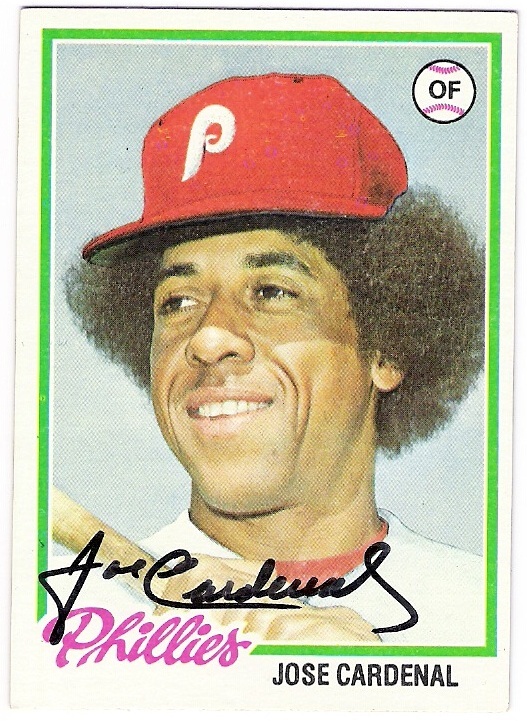 the phillies also had tim mccarver on their team back then to make sure steve carlton was appeased. 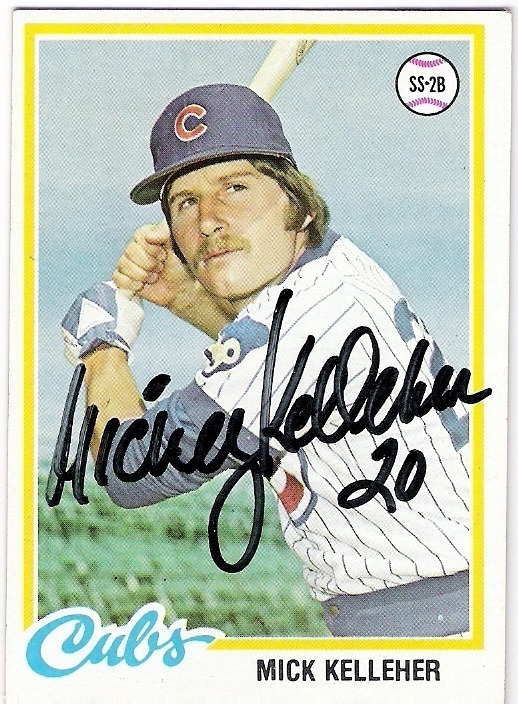 until 1978 when he went to the cubs and became their primary receiver. 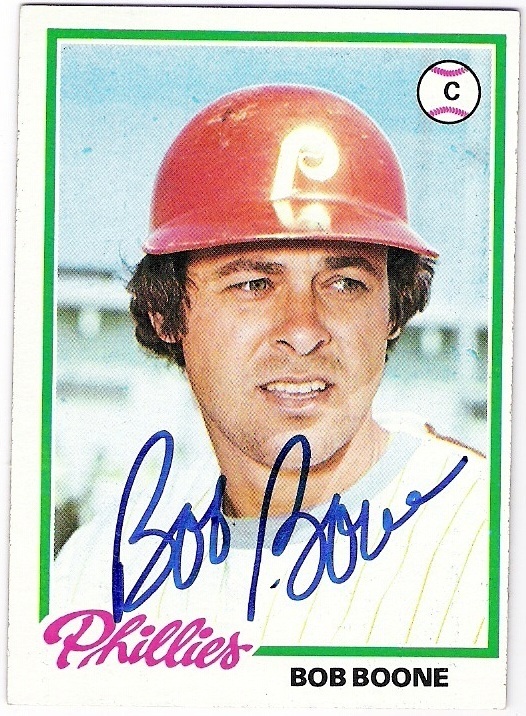 after the 1978 season, he was traded to the phillies, where he was behind boone in the depth chart. 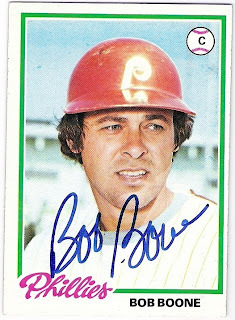 in exchange, the cubs got a new starting catcher from the phils - none other than barry foote. ah, the circle of life. 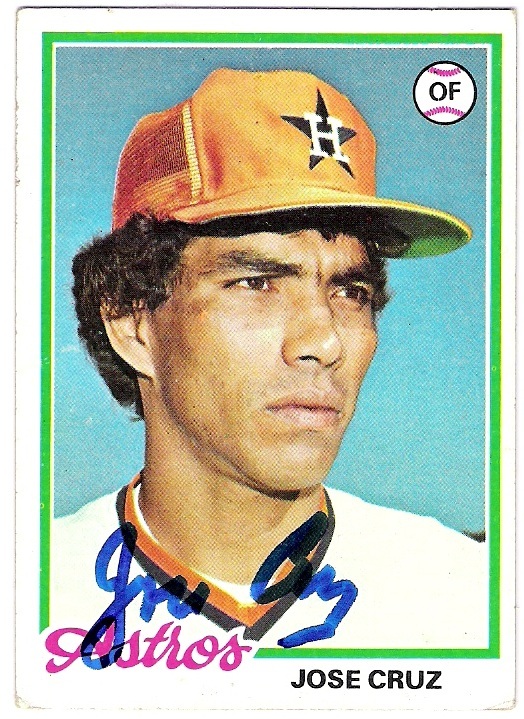 he was, however, a gold glove third baseman for the astros in the early 70's. 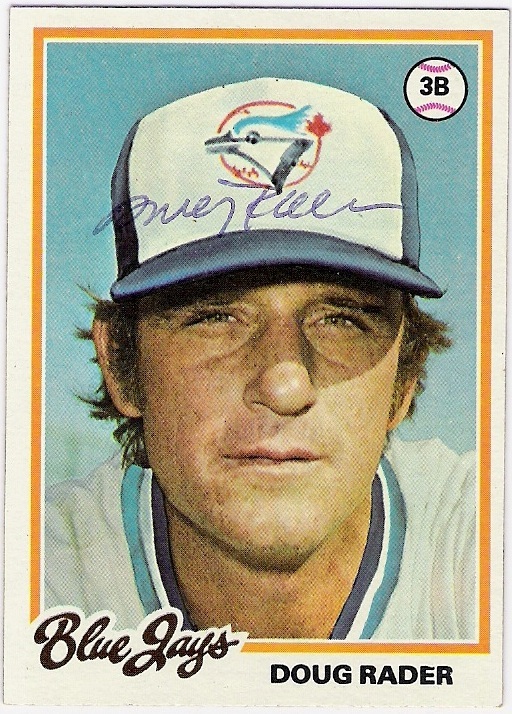 he finished his playing career with the blue jays in 1977 making this card, like capra's above, a final tribute. 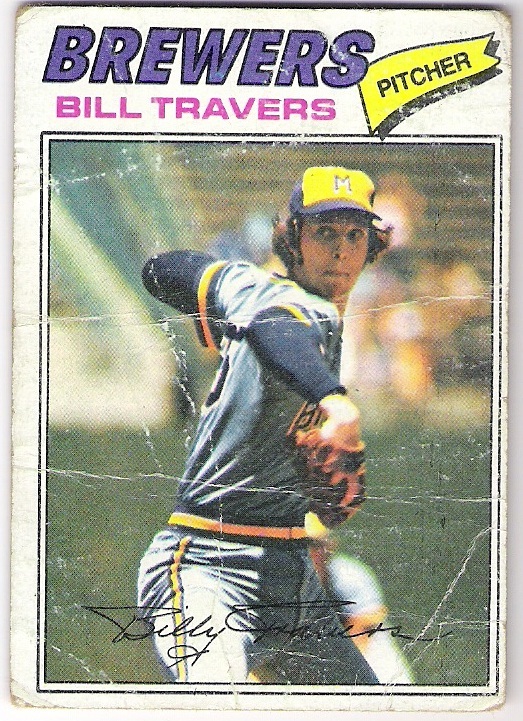 he later managed the rangers, white sox, and angels. 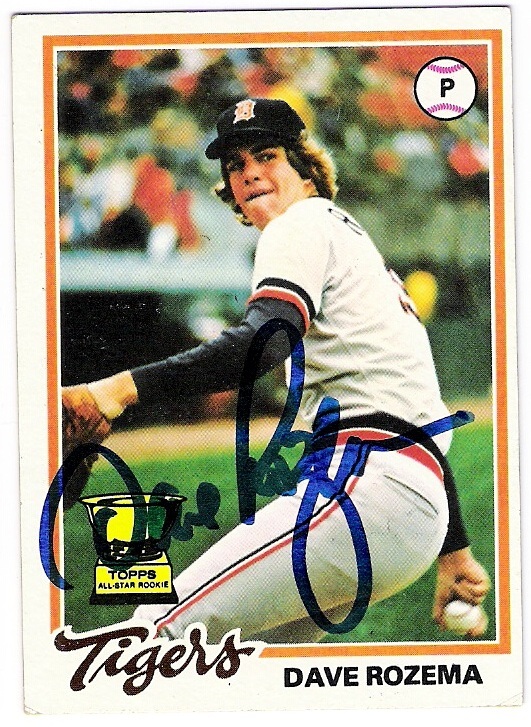 rozema's 1977 season was also his best, although he pitched in the big leagues for 10 years. he was on the '84 tigers world championship team but was apparently left off the postseason roster. 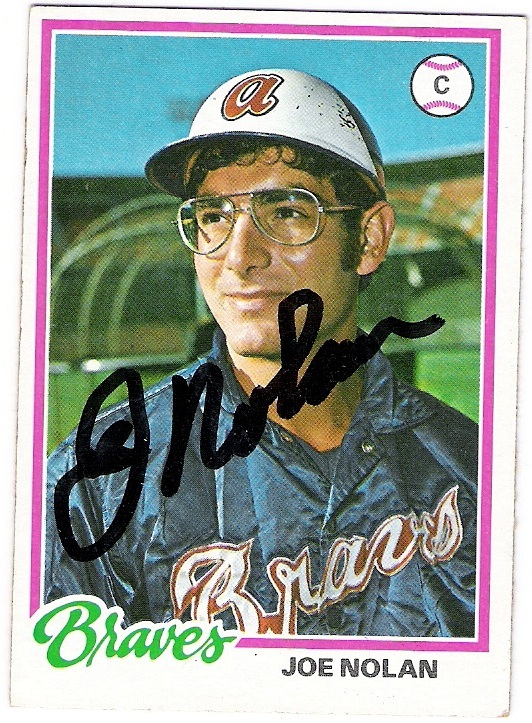 lou whitaker wasn't. 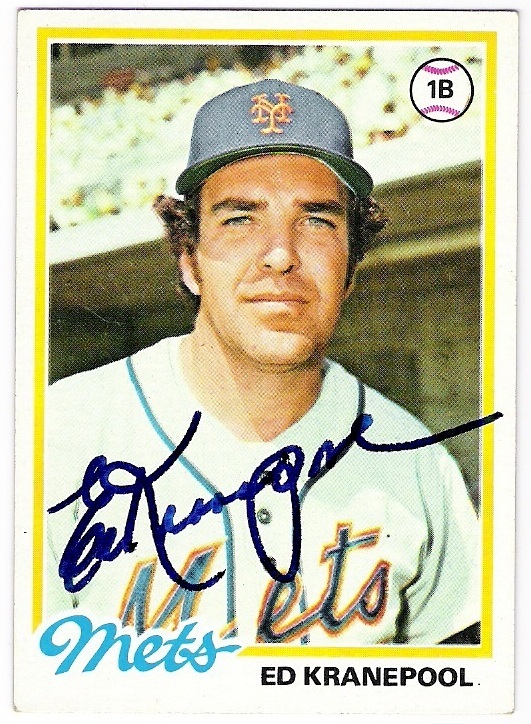 unfortunately for me, whitaker doesn't sign ttm. sam perlozzod does. perlozzo played in 10 games for the twins in 1977 and 2 more for the padres in 1979. he managed the orioles a few years ago for a couple of seasons. 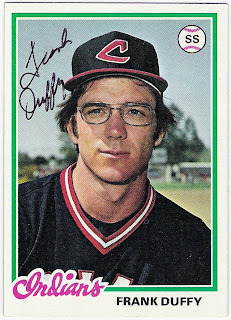 this card is currently in the hands of garth iorg. i hope he sends it back. 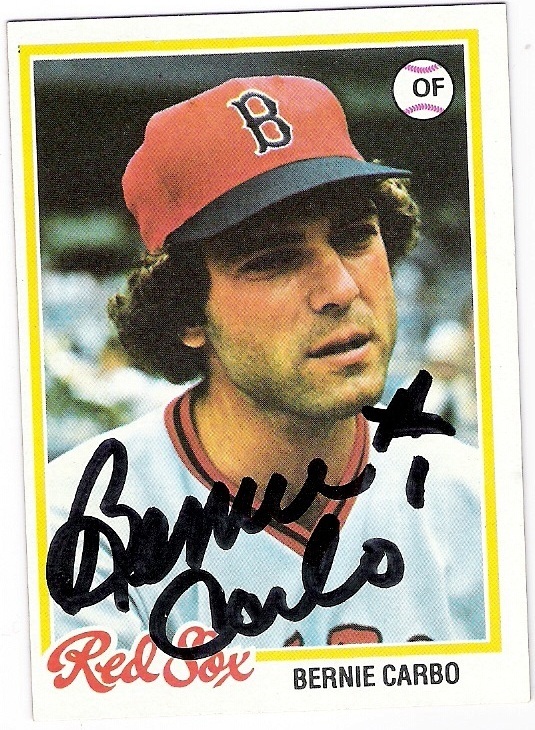 bobby v signed a couple cards for me before, but i had to get his 78 card signed too. it must be noted that valentine succeeded the aforementioned doug rader as manager of the rangers in 1985.
the last post i did like this resulted in ryan from the great orioles autograph project sending me a signed 78 opc lynn card. 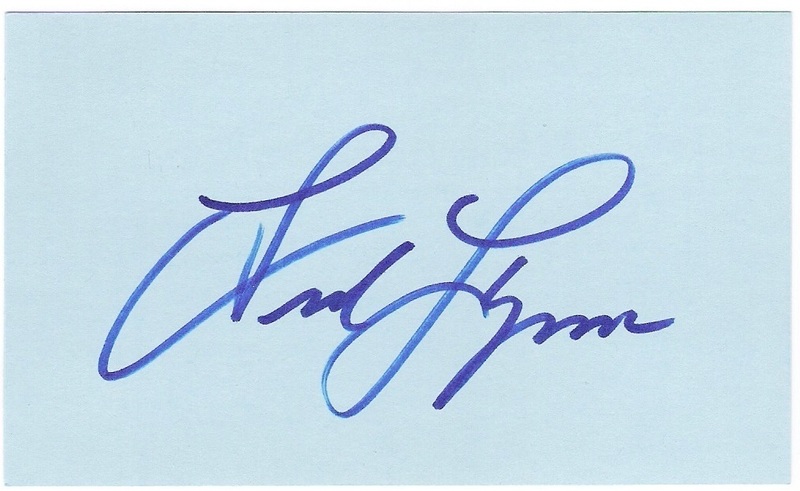 shortly thereafter, i received this index card from the man himself. 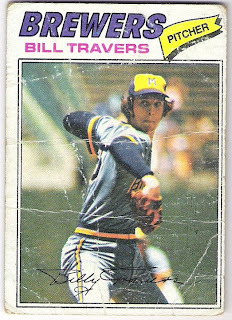 it's not a 1978 topps card, but it's a good success nonetheless. thanks to all the guys who signed, it is appreciated. steve kemp (no doubt shown here in his dr. bruce banner mode - you know what i am saying, right?) is doing some math at a usc chalkboard. or maybe a whiteboard if those were around in the 1970's but that doesn't matter. 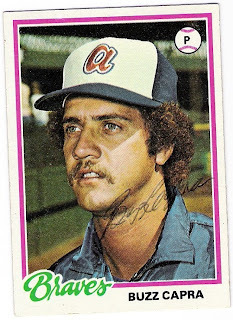 let's do some math to find out how kemp calculated his senior year batting average of .435.
he obviously did not just divide his hits by his number of at bats; that would be too easy. so, let's work backwards. 0.435 divided by 0.06 is 7.25. subtract 7 from that and we get 0.25. multiply by 276 and we get the number kemp started his calculation with. 69.
if you were to look at joe moeller's stats at baseball reference, you would see that he pitched for the dodgers from 1962 (as a 19-year old) through 1971. that includes full seasons in the minors that happened to coincide with the dodgers' two world championships in the 60's (1963 and 1965), although he did make an appearance in the 1966 fall classic. 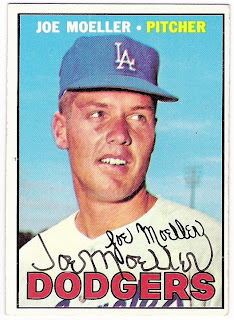 here's his 1965 topps card as proof positive of his status as a dodger. for his career, moeller had a 26-36 record with 4 saves and a shutout - a 6-hitter against the braves in 1970. i suppose it makes sense that the batter moeller faced more times than any other in his career was hank aaron (29 plate appearances) to whom he surrendered home run number 270. he also fanned him 3 times. speaking of strikeout victims, moeller most frequent victim was ron santo (6 k's in 22 pa's) followed closely by willie mccovey (5 in 16). 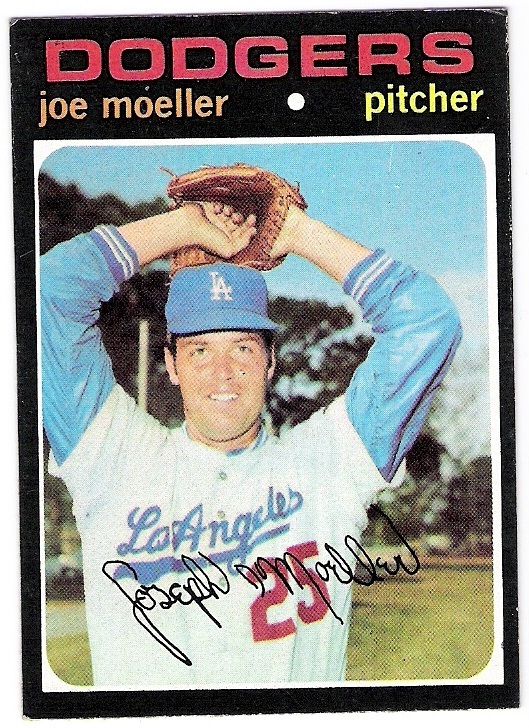 after the 1971 season, moeller pitched in the minors for two seasons in the padre and phillie organizations without making it back to the majors, unfortunately. 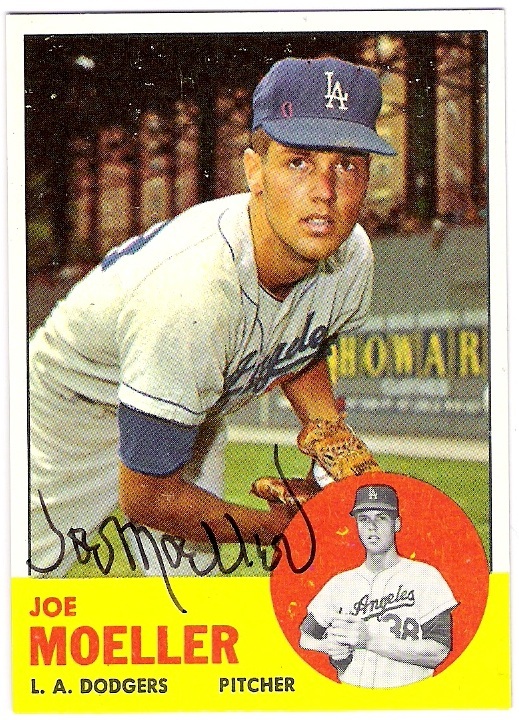 eventually, he rejoined the dodgers as part of their alumni speaking bureau/community outreach group. 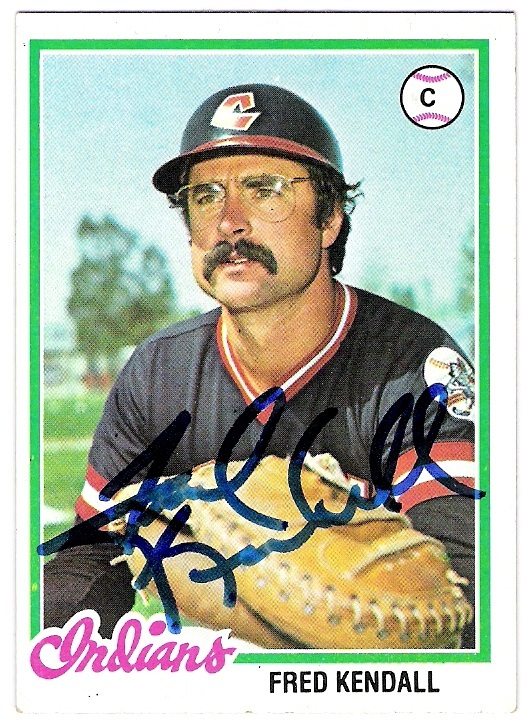 i believe he is still affiliated to this day, unless frank mccourt has fired him for some reason. 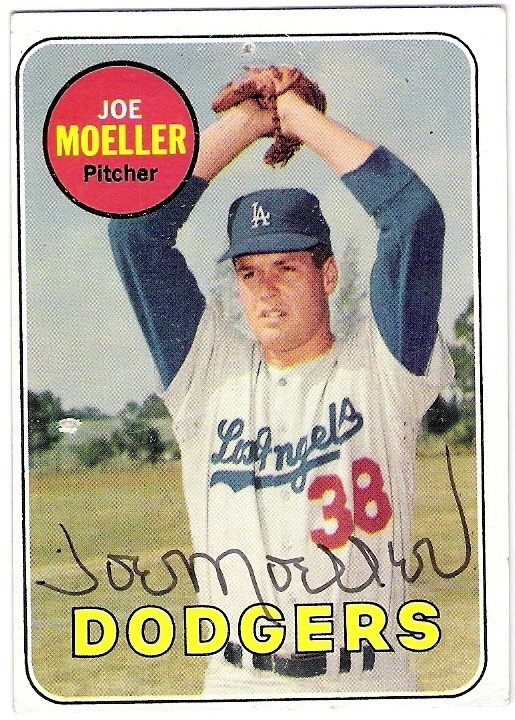 over the last couple of years i have sent a few cards his way, c/o the dodgers, and they have always come back signed. that's an older photo, as moeller switched to number 27 when he rejoined the dodgers in 1968, and then changed to 25 in 1969.
wearing the number that tommy john would claim in 1972.
here's to you, joe moeller, dodger double dipper! thanks for signing my cards! mike vail through the mail success!